Grades PreK - 5 Contains eight major subject categories: Arts, History and Government, Living Things, People, Places, Science and Mathematics, Sports and Hobbies, and World Religions. Has full-featured pictures, sounds and videos. Also includes a section for teachers. Michigan residents or Michigan library access only. Grades PreK - 5. An interactive experience that allows beginning readers to explore fiction and non-fiction designed to increase understanding and fluency. Increase comprehension and have fun at the same time! Michigan residents or Michigan library access only. K-8. Fiction and nonfiction books you can read online - for school and for fun. Search for what you want. Picture books, homework topics, languages learning. Online help available too. Michigan residents or Michigan library access only. 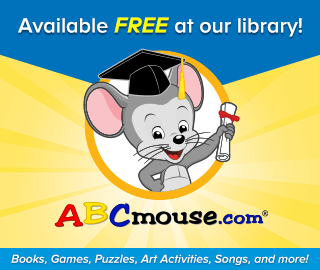 ABCMouse.com is a comprehensive early learning system that supports teachers and empowers young learners, building a foundation for academic success.